Monarch Air Group provides private air charter in Miami, FL. Our clients benefit from top-notch service, unrelenting dedication to safety, wide selection of aircraft, and years of experience in chartering private jets. To obtain a free quote, please use our online quoting tool provided below, or call toll free 1-877-281-3051. Monarch Air Group serves the world’s elite on private jet routes to and from Miami and beyond. Our repeat clientele include Fortune 500 executives and officials from international government agencies and NGOs. Through select joint venture agreements, we provide access to a wide variety of corporate jets and service countless national and international destinations. We are certified third party consultants to exceed industry standards in safety and performance. We specialize in providing five-star luxury while maintaining optimum cost effectiveness and logistical efficiency. We fly according to your schedule and will locate the right jet to fit your needs and budget. Whether you plan to conduct in-flight business meetings or relax with friends and family, our customizable amenities ensure your flight will be productive, rejuvenating and ultimately stress-free. Mid-size jets accommodate up to nine passengers and offer an enclosed lavatory and outside luggage compartment. Select jets offer seats in a club-center pattern, ideal for in-flight meetings. Additional amenities further enhance the flight experience. Mid-size jets are ideal for smaller groups, short-range flights, and those seeking a cost-effective private jet without sacrificing speed, convenience and luxury. Heavy jets can accommodate up to 16 passengers and offer a more spacious interior, with a cabin height of over 6 ft. Select jets offer seats that recline into full-length beds, as well as galleys and refreshment bars. Heavy jets are ideal for large groups or long-range nonstop flights. Additional amenities enhance the flight experience. Cruising speed is high while the ride is smooth, quiet and enjoyable. Every client is a VIP. On your next private jet to Miami, enjoy Wi-Fi, catering, massage chairs, flight attendants, digital entertainment, catering and more. Our operators are standing by 24/7 to assist you in scheduling your next luxury air charter to Miami. Call us today for a free quote. 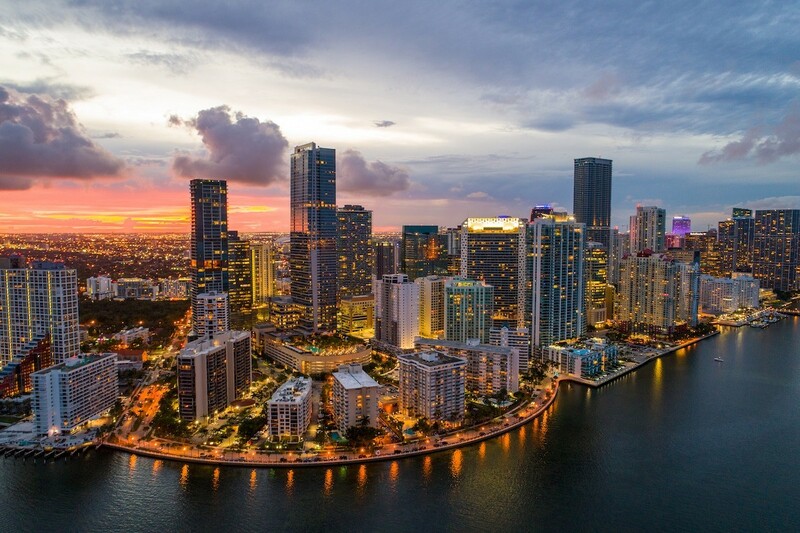 Situated on the Southeastern tip of Florida, Miami is the Sunshine State’s epicenter for international commerce, finance, the Arts, and culture. Having more than eight different accessible airports, Miami serves more than 35 million domestic passengers a year making it the fourth largest populated city in U.S. with a population of 5 million people. It’s home to countless numbers of fashion designers and movie stars. Miami boasts the largest volume of cruise ships in the world. Miami is not only a great vacation spot for families and tourists, but also a national foundation for international trading and commerce. It’s the fifth best place in the U.S. to conduct business. In spite of Miami’s size, in 2008 Forbes Magazine ranked Miami the #1 cleanest city in America. 1. BCT, Public, Boca Raton, United States. 2. BIM, International, Bimini, Bahamas. 3. CXY, Cat Cays, Cat Cays, Bahamas. 4. FLL, Fort Lauderdale/Hollywood International, Fort Lauderdale, United States. 5. FXE, Executive, Fort Lauderdale, United States. 6. HST, AFB, Homestead, United States. 7. HWO, North Perry, Hollywood, United States. 8. JDM, Downtown Heliport, Miami, United States. 9. KYL, Port Largo, Key Largo, United States. 10. LNA, Palm Beach County Park, West Palm Beach, United States. 11. MIA, Miami International Airport, Miami, United States. 12. MPB, SPB, Miami, United States. 13. NSB, North SPB, Bimini, Bahamas. 14. OCA, Ocean Reef, Ocean Reef, United States. 15. OPF, Opa Locka, Miami, United States. 16. PBI, Palm Beach International, West Palm Beach, United States. 17. PPM, Pompano Beach, Pompano Beach, United States. 18. TMB, Tamiami, Miami, United States. 19. TNT, Dade Collier, Miami, United States. 1. Epic Hotel, 270 Biscayne Boulevard Way, Miami. 2. Four Seasons Hotel Miami, 1435 Brickell Avenue, Miami. 3. Doubletree, 1717 North Bayshore Drive, Miami. 4. Four Seasons Hotel Miami, 1435 Brickell Avenue, Miami. 5. InterContinental Miami Hotel, 100 Chopin Plaza, Miami. 6. Sheraton Miami Airport Hotel & Executive Meeting Center, 3900 Northwest 21st Street, Miami. 7. Miami International Airport Hotel, Terminal, Miami. 8. Epic Hotel, 270 Biscayne Boulevard Way, Miami.